Political noise notwithstanding, the region’s economies are in a sweet spot, and should continue to ride the booming Eurozone wave this year. Last year, wiiw looked at 10 themes for Central, East and Southeast Europe (CESEE) in 2017. In general, things went as we had expected. Inflation strengthened, debt yields rose, and growth picked up. Political risk remained high in parts of CESEE, but (outside of Russia and Ukraine) the macroeconomic implications of this were mostly quite limited. Potentially threatening developments from outside the region also largely failed to materialise. Global uncertainty remained high, thanks to Donald Trump, but the implications of this for our region were very limited. As we had anticipated, Brexit drove unity in the EU, although tensions between the remaining 27 member states were visible over fiscal policy and migration. Elections in Western Europe did not lead to populist parties taking power (except in Austria, and here only as a junior partner in the government). However, we did underestimate the pace with which economic growth in CESEE would strengthen, including (in common with many others) not anticipating the extent of the boom that would occur in the eurozone and the extent to which this would spill over to CESEE economies. Many of our estimates for 2017 growth were revised up during the course of last year. This year, we are doing the same exercise again. Below are the ten themes that we think will define CESEE economies in 2018. These issues will be discussed in more detail in our upcoming Spring Forecast Report. The boom in the eurozone shows little sign of petering out. High-frequency sentiment indicators are at multi-year and in some cases multi-decade highs. Purchasing managers’ index (PMI) and other sentiment for Germany—the lynchpin of the European economy and a key market for all CESEE countries—indicate the emergence of major capacity constraints. The response is likely to be yet more hiring and investment, propelling growth higher. The implications for CESEE of this are positive, although some countries will benefit more than others. Those with the strongest trade integration with Germany and the rest of the core eurozone (generally, but not exclusively, those closest to it) will continue to benefit the most. However, the tentacles of the mighty German industrial supply chain are stretching ever further into CESEE. In general, the rising tide of core eurozone growth will lift all boats in CESEE. Countries reliant on tourism such as Croatia are also likely to benefit from stronger income growth and larger numbers of people in employment in the big, wealthy, Western European countries. This will be reinforced by heightened security risk perceptions towards many competitor markets, including Turkey and parts of North Africa. 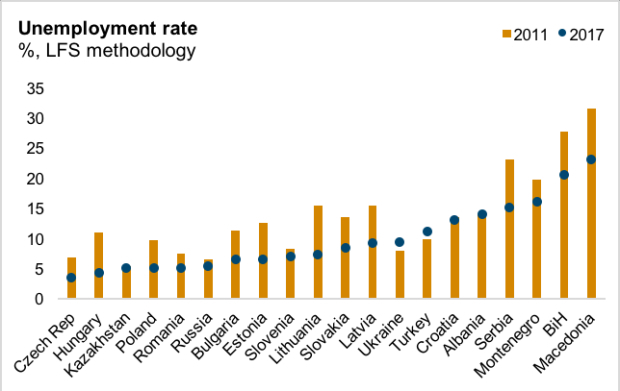 Economies reliant on remittances (generally in the Balkans and CIS) will also benefit from the boom in Western Europe. In our region, 2017 was the year of EU-CEE. 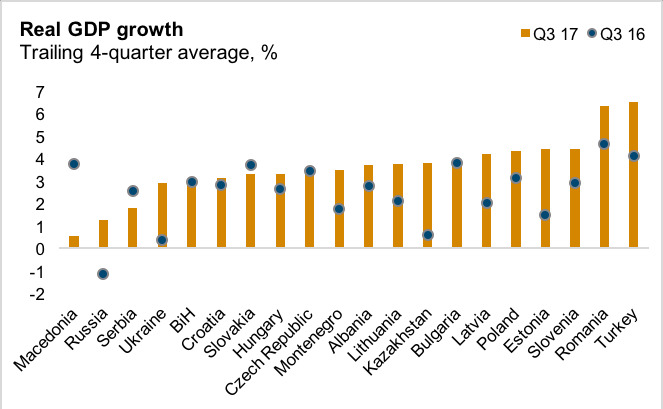 Most EU member states in the region enjoyed very strong growth. In the four quarters to Q3 2017, Romania was the clear frontrunner among EU member states in the region, with real GDP rising by an average 6.5% year on year over the period, although all EU member states in the region grew by an average 3% or more. With the exception of Turkey (owing to particular circumstances), most non-EU members in the region fared less well in 2017, particularly Russia, Ukraine and parts of the Balkans. However, even for most of these countries, economic activity improved compared with a year earlier. This year, we maintain a positive outlook on all EU-CEE members, in no small part because of the generally strong trade integration with Western Europe. However, across the Balkans, CIS and Ukraine, we expect a generally better year. High frequency sentiment indicators suggest a gradual firming of growth momentum in Russia, which will have positive spill-overs for other countries in the region. Meanwhile after a disappointing 2017, the outlook for Serbia in 2018 is better. Across the region, almost all countries will grow faster in 2017-19 on average than in 2014-16 (see chart below). Growth in CESEE this year will also become more broad-based in terms of its drivers. While better rates of economic activity in the last few years across the continent has relied heavily on stimulus from lower oil prices and ultra-loose monetary policy, growth is now being driven increasingly by rising wages and higher investment, the latter reflecting stronger confidence in most places and emerging capacity constraints. Investment catch-up potential is also significant; real gross fixed capital formation has collapsed as a share of GDP almost everywhere in the region since 2008. 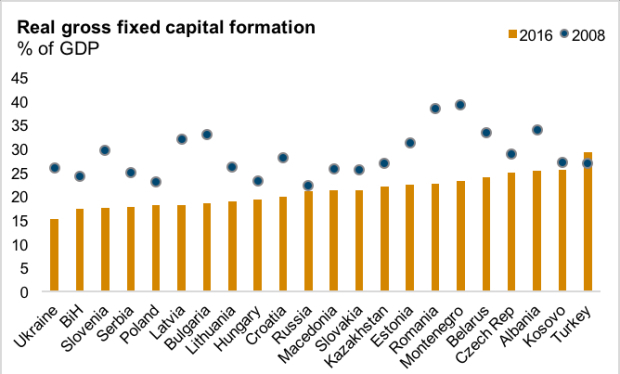 Stronger inflows of EU transfers as the new funding period gets into full swing will also make a significant contribution to investment growth in EU-CEE. Net inflows from the EU budget are on average equivalent to several percentage points of GDP per year for all member states in the region. A combination of generally strong economic growth and high rates of emigration have forced down unemployment rates and led to a tightening of labour markets across much of CESEE in the last few years. With growth set to remain strong in most places in 2018, these developments are likely to have further to run. However, while this should force up wages and—combined with Brexit—see some workers return from Western Europe, we do not expect a fundamental change in dynamics. Even in the wealthier parts of CESEE, wages remain far below those available in Western Europe, which will ensure continued positive rates of net emigration, albeit potentially at a slower rate than in previous years. The positive outlook comes with warnings about overheating, particularly in some parts of the region. 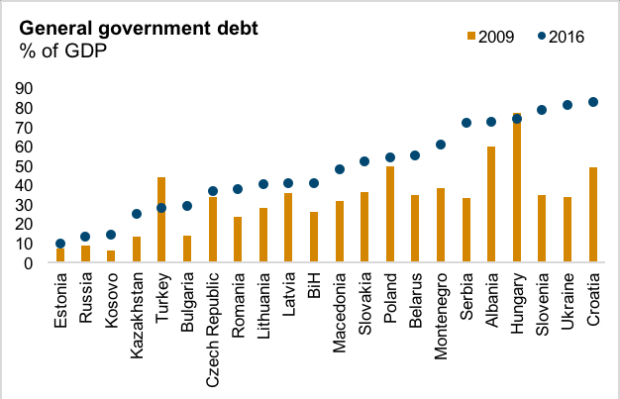 We see these risks most clearly in Romania and Turkey, where appropriate fiscal and monetary actions will be required to prevent events taking a more dangerous course. Nominal labour costs in Romania rose by 16.5% year on year in Q3. However, elsewhere in CESEE (notably in some EU members) there is evidence of increasingly pro-cyclical fiscal policy being pursued. Without policy changes, these issues will remain firmly on the agenda in 2018. The opening of a Macroeconomic Imbalance Procedure (MIP) by the European Commission against one or more EU-CEE countries certainly cannot be ruled out. Aside from pockets of visible overheating, inflation is picking up across most of the region, in contrast to most of Western Europe (where core inflation remains stubbornly low). 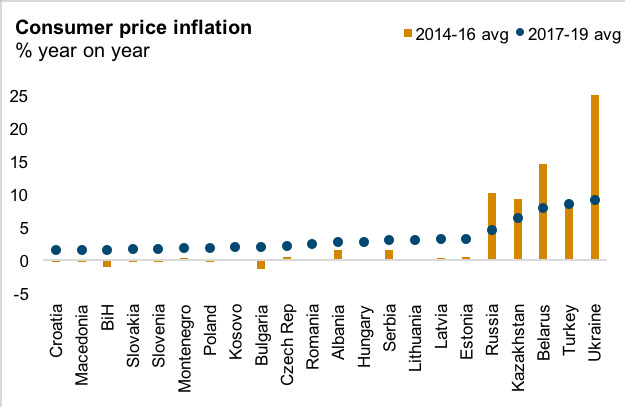 The most recent release by Eurostat (for November) showed that annual price growth in all EU-CEE countries except Slovenia (1.4%) and Croatia (1.6%) was at 2% or above. In Lithuania (4.2%) and Estonia (4.5%) it was more than double the EBC’s target of just below 2%. 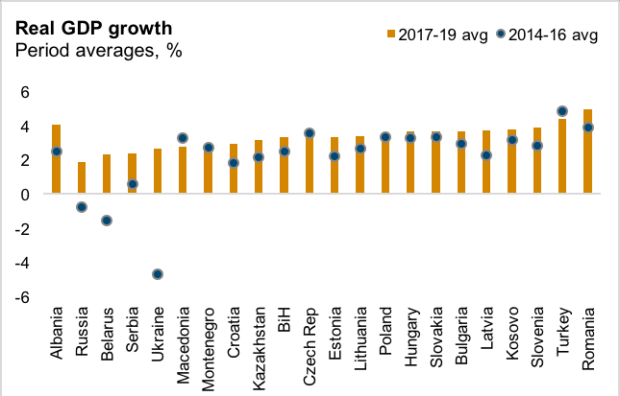 However, the broader picture is that inflation is actually quite subdued in the context of strong growth and tightening labour markets (labour costs rose by at least 4.8% year on year in every country in EU-CEE in Q3 2017). Even in countries where it is higher, much of this reflects cost-push factors from oil and food which will soon wear off. This links to a broader debate in economics about the apparent breakdown of the Phillips curve, with tumbling unemployment rates not having a marked impact on inflation. Inflation should continue to rise across the region (albeit with some volatility linked to moves in energy and food prices). Labour market tightness, plus increases in the minimum wage in some parts of the region, will increase upward pressure on prices. Recent spikes in labours costs in parts of CESEE could presage a more pronounced jump in core inflation at some point. However, our core view is that prices are only likely to rise slowly. Outside of EU-CEE and the Balkans, inflation will remain much higher, but across the CIS and Ukraine it will stay comfortably below the peak levels of recent years. Source: wiiw Annual Database and forecasts. Sovereign debt markets across CESEE have experienced a strong bull run in recent years, reflecting both lower inflation (in the case of local debt) and ultra-loose monetary policy by major central banks around the world (in the case of hard currency paper). Both of these factors have now turned, and the normalisation and or/tightening of policy by banks such as the ECB and the Fed will have important implications for hard currency debt markets in CESEE. Fundamentals suggest that much of the region is not particularly well placed to deal with this. 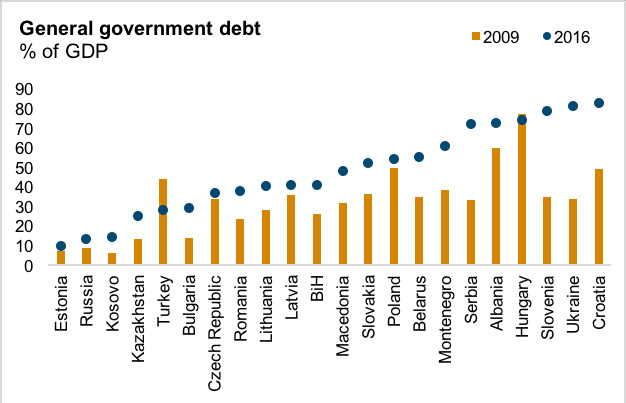 Public debt/GDP ratios, for example, have risen almost everywhere in CESEE since the crisis (see chart below). However, the greatest risks may be on the corporate debt side. Countries and companies more exposed to US dollar rates are in the firing line, with the Fed already in tightening mode, whereas those with a greater reliance on euro funding should be more insulated form market turbulence (subdued core inflation in Western Europe will keep the ECB dovish). With US policy remaining unpredictable, and growth there heading higher, a more aggressive hike in US rates cannot be ruled out. This could be highly destabilising for parts of CESEE, notably Turkey, which is running a large current account deficit. A further risk on the financial markets side comes from equities. Global stock markets are looking frothy, not least in the US. The Schiller Price/Earnings ratio for the S&P 500—which measures inflation-adjusted 10-year average earnings against stock prices—is above 33, its second highest level on record (it reached 44.19 during the stock market bubble in December 1999), and almost double its mean of 16.81. However, the sheer volume of capital in the global financial system makes it difficult to compare the current period with the past in terms of valuations. Such has been the relentless march higher of equities that even some famously bearish investors have turned bullish. However, there is clearly a risk of a major correction at some point, and a collapse in US stock prices would certainly have major global implications, including for CESEE. As we outlined in a special topic accompanying our Autumn Forecast, the pace of real per capita GDP convergence with Western European levels will be painfully slow in much of the region, and even the frontrunners will not get close to German or Austrian levels anytime soon. Moreover, the high share of foreign ownership of industry, and consequent loss of some export revenues via the primary income account, means that wage convergence in the region is at an even lower level. As part of a broader backlash against globalisation (which is of course not limited to CESEE), this will continue to feed disenchantment in the region, and is part of the reason for the strength of populist parties and more confrontational stance towards Brussels in some countries. There is no quick fix for this issue, and we expect it to remain firmly on the agenda in 2018. Many people (including us) probably overestimated the impact that political noise would have on economic growth this year. While there are visible examples of political factors affecting growth within CESEE (especially in Russia/Ukraine), the impact of external factors has in general been remarkably small. However, this is not guaranteed to last. Issues such as the fallout from Brexit, the potential for more protectionist trade policy emanating from the US (including the possibility of a trade war with China), and east-west ructions at the EU level remain sources of risk for the region. One major issue looming large is the upcoming Italian election, which represents a much bigger threat to the stability of the eurozone than polls in the Netherlands, France, Germany and Austria did last year. The impact of a negative hit to economic growth or financial market stability in the eurozone as a result of the election in Italy would certainly be problematic for CESEE. There is also the potential for new threats to emerge from within the region this year. Several elections are scheduled, including in Russia, the Czech Republic and Bosnia. An early election in Turkey is also possible. Divisions between some older and some newer EU member states became more visible in 2017, and there is the potential for the situation to escalate further. Spats over migration, EU funds, child benefit payments, Brussels’ policing of the rule of law within member states, and relations with Russia, could again emerge this year. Discussions over the next (post-Brexit) EU budget will continue, with wealthier EU members likely to be highly resistant to increasing their contributions in order to make up the UK shortfall. The implications of this are difficult to gauge. Political stasis in Germany, and the potential for a messy Italian election outcome, have put serious roadblocks in the way of French President Emmanuel Macron’s drive for greater EU reform. Nevertheless, the conditions for a “coalition of the willing” within the EU and/or eurozone to move forward together with greater integration appear to exist. There are evidently risks of a greater formalisation of a two-speed Europe, with potentially negative implications for EU-CEE.